I ate this	2 comments	by K.
Missing a kick, but still a nice, versatile pesto. When I received my organic produce shipment this past Friday, I noticed about half of my basket was taken up by the leaves of this small bunch of carrots. My first thought was “I can’t throw all of that out!” So I was off to visit my friend Google for some advice on what to do with them. I found some recipes and quickly decided to go for the carrot-top pesto, mostly because I love pesto so much. There are all sorts of recipes on how to turn carrot greens into pesto. I’ll quote this one for the nice, colorful pictures. But you basically want to proceed as you would to make a basil pesto. I found some advice that said you should use some acidic element, such as lemon or vinegar, to hide the bitterness from the leaves. I used lemon and it either worked or the leaves were not all that bitter to start with. A happy side effect of the lemon was that I needed to add less salt than usual to get it to taste just right. I made my pesto with walnuts, fresh garlic, Parmesan cheese, olive oil, lemon, salt, pepper and, of course, carrot tops. I just put everything in the blender. Some of the recipes I saw cooked the tops slightly, but for me pesto equals raw, fresh herbs. This turned out to be the mildest tasting pesto I’ve made. I’ve prepared it before using fresh basil, oregano, cilantro or parsley, and in each case you can distinctly taste the base herb. Here it’s the flavors of the other ingredients that dominate. It made for a nice companion to pasta and a yummy spread for sandwiches. I’ll be keeping this one in my repertoire. 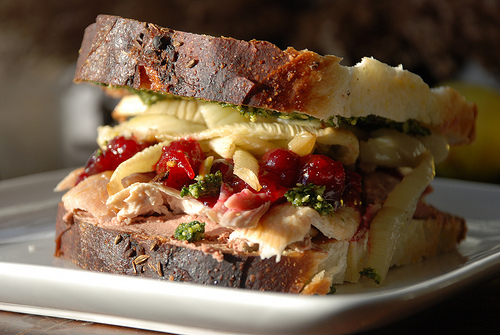 Photo: turkey sandwich by kthread.